Like sand through the hourglass, so are the Days of our Lives. They've been crazy at the Swank house lately. 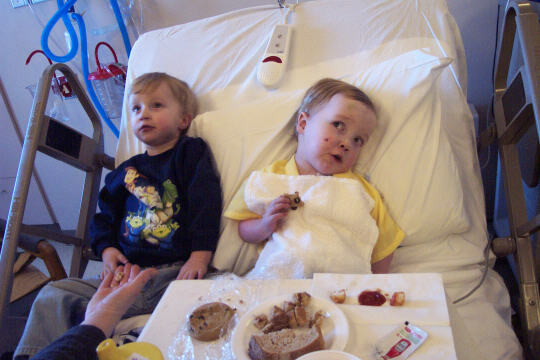 Luke stayed in the hospital for 9 days this last stint. He earned quite the reputation among the nursing staff because for the first several days he was there, he'd start screaming the second one of them stepped into view!! He eventually settled down. We spent many hours tooling around in a red rider wagon, playing in the play room, and watching TV in the family lounge. By the end of his stay, he was even nice to some of his nurses which is a major breakthrough in the life of Luke. Our cardiologist said he thought we'd be OK this time but warned that we might be dealing with these kinds of issues for several months and shouldn't be surprised if we need to return to the hospital again. So we were very excited to leave the hospital on Friday. That is until Luke started throwing up an hour after he came home (something he hasn't done since his surgery). At first we'd blamed one of his medicines (he has to take 5 different kinds of drugs twice a day), but once his brother started throwing up this morning, we determined that he'd picked up a bug at the hospital! Just our luck to have Lukie catch the flu on the day we come home!! Luke seems better now and has even started walking around a bit this morning, so we're very hopeful that we're on the Road to Recovery again. Hopefully, we won't need to make any more pitstops again! Rudy has been responding to his prednizone treatments very well and seems like a new dog! He has more energy than he's had in years. We know it probably won't last tremendously long, but we're hopeful he can at least make it through the spring. We'd like to have him enjoy his favorite things a few more times like going for walks and swimming in the lake. I hope this is the last email I have to send like this for a long, long time!! We really appreciate everyone's thoughtful emails, support and prayers. The above pictures were taken the weekend before the following events. Luke was re-admitted to the hospital on Wednesday. An appointment with his cardiologist revealed a fluid build-up on his chest that was collapsing his right lung. Fluid was also staying heavy on his abdomen and a suspicious Echo reading may have been indicating a blood clot. First things first, we had to deal with the smashed lung. The head surgeon quickly handled the job. Luke had to be placed back on the respirator (always a nice sign that we're in for a lengthy hospital stay) so he'd be "comfortable" for the procedure our cardiologist explained. The surgeon used a spear of some sort and "tapped" 6 ounces of milky fluid out of his chest. 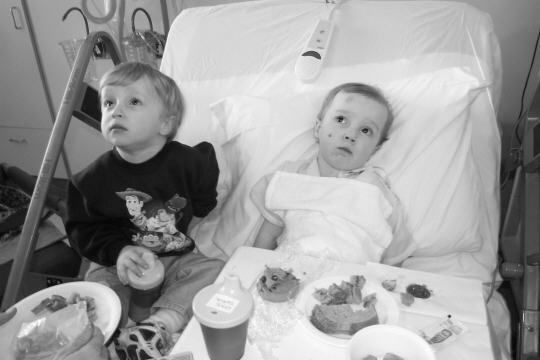 The milk Luke had been drinking was leaking through his lymph system into his chest cavity. It's apparently a fairly common complication associated with the Fontan surgery called a "Kyle Leak". I don't completely understand how it works, but am told it should be cured by putting Luke on a "no fat" diet for a month or few. He's shown no sign of re-accumulation in his chest cavity yesterday or today. So that's a good thing. Next priority, the suspicious Echo reading. The doctors were suspicious that Luke had a blood clot in the gortex tube that bridged his inferior vena cava and his pulmonary artery installed during the Fontan procedure. A shadow on an Xray seemed to confirm this finding. They gave Luke heavy blood thinning drugs to try to dissolve the potential clot while they debated over how they should deal with the situation. The doctors were very concerned about blood clots because if one becomes dislodged, it could do all sorts of damage. There are options to remove a clot, but they sounded pretty scary. We had discussions with nurses and doctors regarding "roto-rooter" type treatments via heart cath to remove clots. Further discussions with the head surgeon brought up the fact that even if we were able to remove clots found, there was a good chance that we'd have to take down the Fontan procedure and be back to where we were a month ago with Luke's heart condition. Needless to say, none of these outcomes sounded good and they've haunted me the past two days. They needed first to confirm that it really was a blood clot. They contemplated an MRI, but determined because of the metal wires attached to Luke's heart in case he ever needs a pacemaker, this option wouldn't work. They performed a cat scan, but it turned out the procedure wasn't effective reading through the gortex tube. So they decided a heart Catheterization was necessary. The problem with this was we couldn't get in until Friday morning. Luke would have to be on the ventilator for another day. My worry level about blood clots was doubling in intensity every hour on the hour. The heart cath was scheduled for 9:30am this morning. So at about 11:15, we started rolling him through the long tunnel over to Abbott Hospital where the Cath Lab is. We had to sign a release to do the test. The doctor hand wrote possible risks on the form and I struggled with seeing the word death written in black ink. Then I had to sign it. Long story, short. The doctor went in and found no evidence of a blood clot. We were very happy with the outcome. So Luke was extubated tonight and we're back on the road to recovery. We still have to figure out these fluid issues, but it seems some of our critical fears have subsided, at least for the moment. Maybe we'll even get to come home again in the next few days. Home would be so cool. I wish I had the same positive outlook for Rudy, but unfortunately I don't. Rudy's biopsy report came back today and it turns out he does have cancer. The vet explained we could possibly do chemo treatments, but it would probably only buy us a year and his quality of life would not be the best. We have him on several meds right now to help keep him comfortable. Although he doesn't have much in the energy department, he does still greet me at the door with his tail wagging and doesn't exhibit any obvious signs of pain. We strive to keep a positive attitude about things, but some days it's really tough. We've had a pretty challenging week at the Swank House to say the least. Luke started showing signs of heavy fluid accumulation on his stomach over the weekend. We took him in to our cardiologist on Monday morning who gave him more medication to try to remove it. Luke became more and more uncomfortable each day, refusing to stand or walk and not sleeping very well. 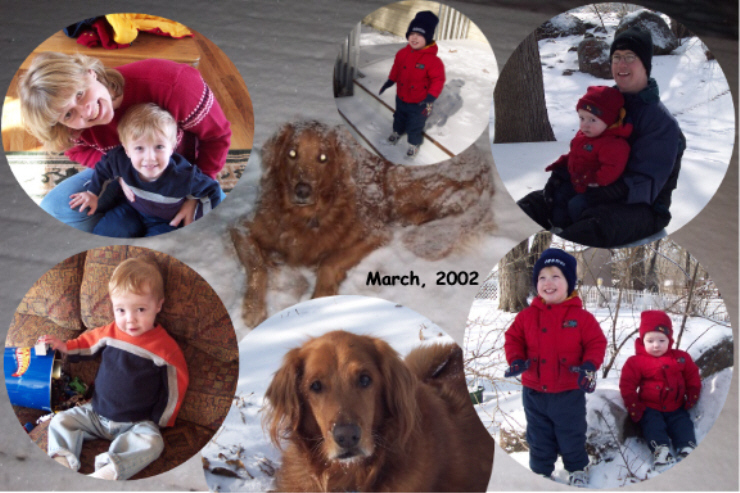 On Monday afternoon, we took our beloved dog, Rudy to the vet because he'd suddenly refused to eat a few days before. She discovered a lump on the back of his throat. Further tests revealed it to be rather large. She performed a biopsy and we tried to schedule surgery, however the surgeon refused to schedule it until we get the results back later today. If it's malignant we'll most likely have to call it a life and let him go. I do have several pictures of Rudy on Shortarmguy under the Family Photo Album Page (Go to the Rudy page) for those of you who'd like to see our first born. I have a good friend at work that says where he grew up, they believed that a good pet will take death away from a family member. So if it is his time to go, I'll always believe that in some cosmic sense that Rudy was Luke's hero. The timing is just too bizarre for me to accept any other explanation. So yesterday, while we're all wrapped up in worrying about Rudy's test results and believing that Luker is doing well on his road to recovery, Sheri takes Luke in to his next scheduled cardiologist appointment. They then discover that Luke's fluid is now building around his lungs and one of his lungs has collapsed. As if that weren't enough, his Echo also showed what could be a blood clot somewhere in his heart. So we have a quick nervous breakdown for dad , while Luke is re-admitted to the hospital. He's been put back on the respirator and the surgeon removed the liquid off his chest with a needle. His lungs look good again. They're also pumping him full of powerful blood thinners to hopefully dissolve that blood clot. He'll probably stay on the ventilator at least until tomorrow and possibly longer. We'll need to watch for additional fluid on his chest, get the fluid off his stomach and get any clots out of his system. Then we'll have to get his system re-balanced again by adjusting his medication. We could be in for a lengthy hospital stay. So I'm coming back to the well and asking for all you wonderful people that have been praying for us to maybe send another dose or two. I think I'm going to stop and buy some lottery tickets today, because our luck has got to be coming back strong any time now!!! I'm wide awake at 2:30am on a Monday night and couldn't be happier. Luke came home from the hospital yesterday. Oh sure, he may be crankier than Archie Bunker...but he's home. I prayed hard for two years straight that I'd be able to say that after this surgery. His surgery went great! In the words of the anesthesiologist, "It went smoother than I think any of us even expected." Now he looks more pink than blue and his O2 levels are around 85% levels instead of the 60% levels he had before surgery. Our cardiologist said they should even climb more in the coming weeks, hopefully leveling out in the low 90's. Luke was a real trooper during his hospital stay, although the pleas "Go home" and "outside" were pretty common. He's never been a big fan of doctors and nurses. As a matter of fact, it usually takes both mom and dad to hold him down during regular doctor visits, but he held tough in his days strapped to a hospital bed. One of the nurses even commented to me that she could tell how sweet he is normally, because she doesn't get many kids his age that say "Thank You" after she gives them their medicine. He may have said it between screams of rage with tears streaming down his face, but he still said it! When our cardiologist, Dr. Singh, asked Luke yesterday if he was ready to go home, he practically jumped out of the bed. Unfortunately for Luke's mom, he had to sit in the hospital for another 6 hours before we were finally discharged. He kept repeatedly asking her for "coat on", "shoes" and "Go ride". So now we're home and feel very blessed. We still have some challenges. Luke will have to go to the doctor every week for awhile to make sure no fluid build-ups start happening and he'll be on coumadin (a strong blood-thinning drug) for a long time, possibly his whole life. So we'll have to be very cautious about injuries, bumps, and bruises. It's also likely that he will need additional surgeries and possibly even a heart transplant at some point in his life, but hopefully nothing else will need to be done for many, many years. It's a small price to pay to have this wonderful little guy in our life. We appreciate so much everyone's prayers and support. People have been so nice to us the past few weeks, that it's hard to come up with words to describe it, so let me just say two. We are pleased to announce that Luke's surgery went very well yesterday!! We are so appreciative to all our friends and family that were praying for him or sending their positive thoughts!! Our cup is overflowing with all the help and support we've received over the past few days! Thank you all so much! Luke is not out of the woods yet, but he has taken a huge step in his path towards daylight. We're hopeful that he will be able to come off the respirator either today or tomorrow. We have to be very observant of fluid build-ups around his lungs or in his abdomen because if this happens we may be in for a long, long hospital stay. There's also a good chance that Luke will require a permanent pacemaker. But if that's the worst outcome of this procedure, we will be very thankful!! The above photos of Luke were taken shortly after he came out of the operating room. 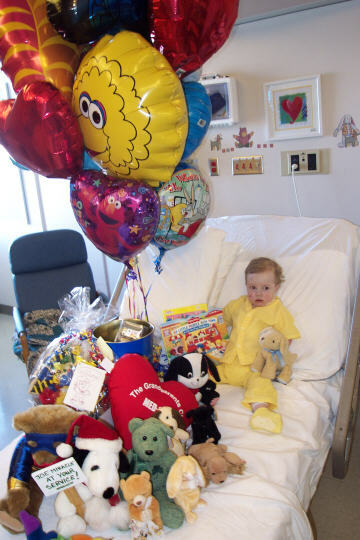 Luke underwent a surgery called the extra-cardiac Fontan procedure which was the 3rd surgery in a 3 stage process. Basically they detached his Inferior Vena Cave (the vein that brings blood from the lower part of his body to his heart) and reattached it to his Pulmonary Artery via a gortex tube. They had performed a similar procedure a couple years ago to his Superior Vena Cava (the vein that brings blood to the heart from the upper part of the body). 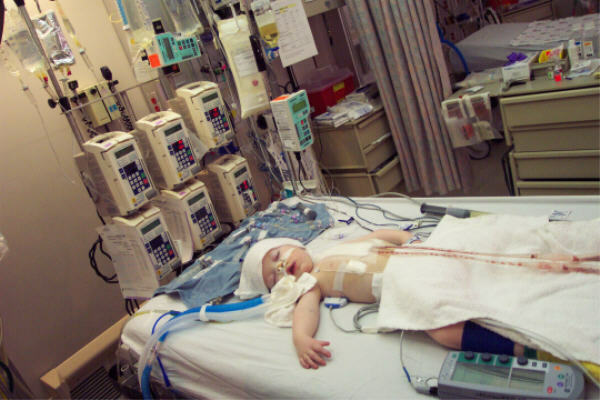 So now all his blood is routed from his body, directly to his lungs, and then to his heart for pumping instead of a normal circulatory pattern that would consist of blood flowing from his body to his heart, to his lungs, and back to his heart for pumping. His oxygenated blood should now be at 90-95% levels instead of the 60-65% levels they were before yesterday's surgery. Luke should be able to grow more quickly and have more energy to defend himself against his brother's professional wrestling maneuvers. I know he's going to be excited about that!! Lukie has a special warrior cry that we use all the time to help prepare him for the tough stuff. We told him that sometimes in life there are battles we have to fight even if we might not want to. When those times come, we need to be brave and not afraid. We'll just charge in yelling our warrior cry and pray to God that at the end of the fight we'll still be standing tall! I'm sure the doctors and nurses may have found it strange that we kept encouraging Luke to holler out at them when things were scary, but I do believe it helped him. We feel so blessed to be where we're at today. Although we know there will still be challenges ahead for us, we strongly feel that God has a special plan for both of our boys and He's going to help them rise to the occasion each and every time! Thanks again to everyone for all your support! 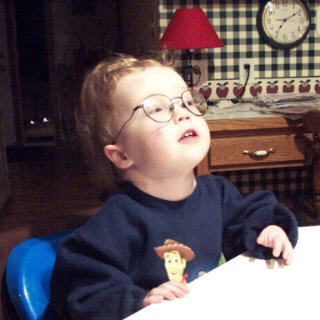 On February 22nd, 2002 our son Luke will undergo heart surgery. This will be his third major heart surgery and his seventh surgery total since he was born two and a half years ago. We're very hopeful this will be his last surgery required for many years. 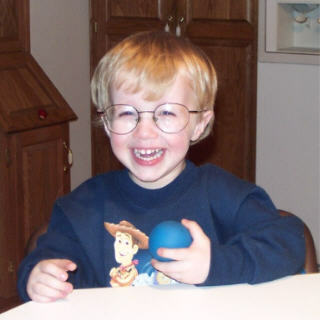 As some of you may recall, we came extremely close to losing Luker after his second heart surgery in November of 1999. Only the skill of his wonderful doctors and a miracle from God brought him home to us. Having Luke with us the two years since that incident has been like having a piece of heaven in our home. 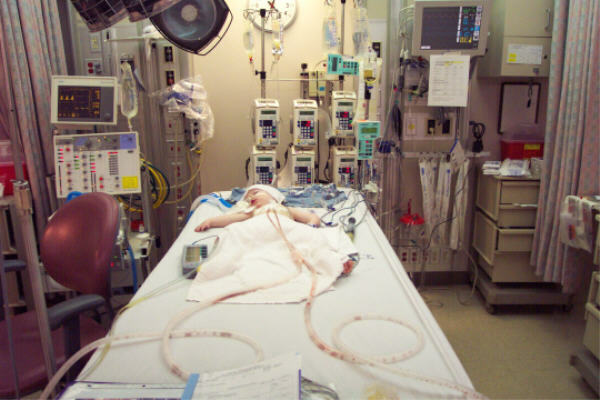 Luke was on a life saving machine called ECMO for 6 days following his scary surgery. During this period of time, we had literally hundreds, if not thousands of people praying for him. We truly believe these prayers were instrumental to Luke's recovery. Which brings me to my request. I ask you for a prayer for Luke. A prayer to give him strength and his doctors wisdom for the procedure. A prayer to provide him with a quick recovery and a minimum amount of pain and suffering. If praying isn't your thing, then perhaps you could just send a positive thought his way on February 22nd. Luke is a little trooper and he has such a beautiful spirit. He and his brother are our little warriors. They're both scarred from the many battles they've fought. Luke's twin brother, Avery, will require an additional heart surgery in the near future. This will be his fourth surgery since he was born. So we'll be bugging you again in the weeks leading up to that event for another quick prayer. With God's help, we're certain Luke will be able to come home to us stronger than ever soon after this next challenge.